Open your eyes and wake up in tropical paradise. Step out onto your balcony and feel the warmth of the golden sun. Look around you and discover warm tropical beaches and the vivid, turquoise ocean, stretching as far as the eye can see. You’ve made it to the perfect tropical getaway. Stroll down the street to discover great eats, rich local culture, and linger after dark to discover an upbeat night scene. “Hola” is the common greeting here but you didn’t need your passport to arrive, nor did you exchange currency upon leaving the airport. Ocean View Paradise, in Rincon, Puerto Rico, is easily a top favorite when considering the perfect tropical getaways. The house provides the luxury and comfort of a resort and is located in a town that offers something for both the beach bum and the outdoor adventurer. Greetings! This hanging sign just represents the beginning of an incredible experience. Located in the Puntas neighborhood of Rincon, Ocean View Paradise is situated in the heart of town and right across from Sandy Beach, one of the top surf beaches in Rincon and a great place to lay out a towel and relax. Spice up your beach time with an ice cold piña colada from Tamboo, a popular restaurant and bar located right on the beach. The property is situated just minutes from other popular downtown restaurants and bars such as Case Verde and Pool Bar. 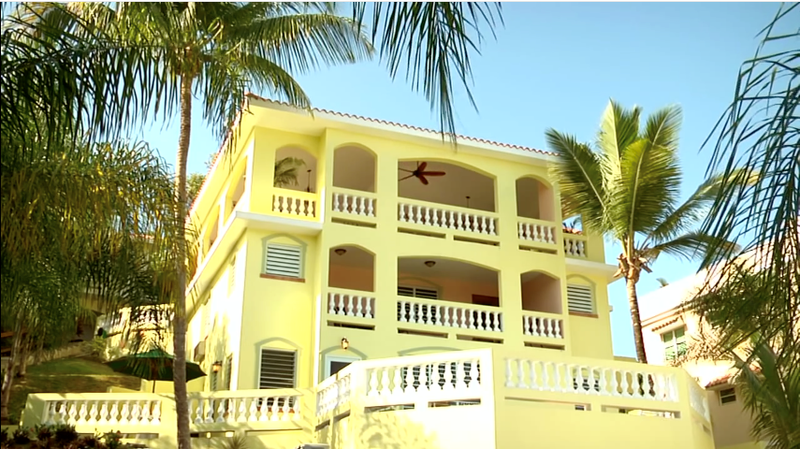 Ocean View Paradise Rincon features a luxurious five bedroom, four bathroom house. Each of the main two floors has their own living area and fully equipped kitchen. Step outside and you can sit in the infinity-edge pool while gazing out at the ocean. Relax in hammocks, enjoy a game on the pool table, or play cards on the deck while looking out at the stars. The Infinity pool is a great place to hang out, relax, and enjoy the incredible views. Thought that was enough? There’s more. The Ocean View Paradise property is situated on approximately one acre of beautiful tropical gardens with a large waterfall, a bar, two houses, a studio and a pavilion, which is great for events. Ocean View Paradise Rincon is an ideal place for families, family reunions, surfers, seniors, yoga retreats, weddings, corporate parties, birthday parties and all types of celebrations. For these larger events, get in touch with the owner and they’ll set you up. The entire property can easily accommodate 26 people comfortably. No need to worry about parking when you arrive. The property is gated with parking onsite. Amenities include wireless internet, air conditioning, washing machine, towels, and more. Line up your shish kebabs because there is even a grill for an afternoon barbeque. You’re all set to go! Gino and Dianna Caruso of Ocean View Paradise visited Puerto Rico in 1995, fell in love with the island, bought property, and built their first house in Ensenada, another area of Rincon. The weather, waves, and beauty of Puerto Rico and its people couldn’t keep them away! They sold their Ensenada house after four years and then found property in Barrio Puntas – the view was breathtaking but the challenge was to develop on a hillside. They started building the house and two years later it became a part of Ocean View Paradise. After a few years the Carusos added on a studio, bar, waterfalls, and eventually built two lower houses on the property with the idea of establishing a destination ideal not only for vacation, but also events. Grab your coffee and sit down before you head to the beach! Rincon is full of activities to satisfy anyone’s interest. There is surfing, yoga, stand up paddleboarding, kayaking, diving with taino divers, and on Thursdays there is an Artwalk where local craftsman show their work and there are beer gardens and live music. Other opportunities for fun include horseback riding, parasailing and kite surfing. Don’t forget to try a La Paguera trip where you can rent small boats or hire someone to take you out. There are other beaches you can visit such as Boquerón, caves to explore, and beautiful waterfalls in San Sebastian. Looking for a tasty brunch with a view? Take your rental car up the hill to The English Rose to satisfy your palate and get charged for the day. Other nearby destinations may include a visit to El Faro Lighthouse, Domes Beach, Tres Palmas Marine Reserve for snorkeling, or simply a visit the local artisan shops. At the end of the day you can wind down at Casa Verde or Tamboo with some drinks and dancing, or simply relax with your companions under the stars by the infinity pool. Rincon has something in store for everyone, whether you are up for adrenaline-filled sports adventures or prefer a stroll along the beach looking for sea glass, hermit crabs, and coconuts. Aguadilla is closest to Rincon (20 minutes away), but only offers overnight flights. From there you can rent a car or take a taxi to Rincon. San Juan has normal flight times but is a 2 hours drive from Rincon. This offers a great opportunity to rent a car and see some of Puerto Rico’s beautiful countryside as you journey to Ocean View Paradise! Rincon is a choose-your-own adventure type of destination, which is why it’s a magnificent place for groups both small and large. At Ocean View Paradise Rincon, you can enjoy all the town has to offer in both comfort and style. Due to its accessibility, limited tourist traffic, and beautiful beaches, Rincon is a destination you’ll want to visit in the next couple years, and because it’s on US territory, you don’t have to worry about your passport! The Ocean View Paradise is offering special packages for Conscious Connection readers. Simply visit their bookings page and mention that you saw the feature in our magazine to save 10% or more on your reservation. Certain holidays excluded.